As a long time fan of the Ecco franchise, I jumped into the Master System port expecting the worse. And do you know what? I was wrong, this game (taking into consideration the limitations of the Master System in comparison to it's Mega Drive counterpart) is a pretty nice faithful recreation of the time travelling porpoise. To those who are no familiar with the Ecco the Dolphin story-line, Ecco is challenged by one of his pod-mates to see how high he can jump. 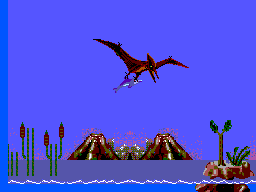 Upon a suspended mid-air flip, a waterspout is created, sucking all lifeforms out of Ecco's home, taking his pod and sending them skyward and into the ship of the life-form responsible for this ocean harvest, the Vortex. Ecco's only choice now is to travel back to this event in time, to be sucked into the waterspout along with his pod, to take the Vortex down, and rescue his pod. But before that, he must find a means to travel back in time. Thus Ecco's adventure begins. 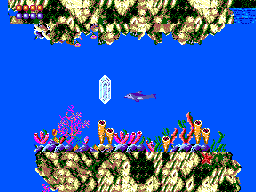 First and foremost, the Master System port has a feature not included in the Mega Drive version, the introduction, which includes an exclusive "whale song" and some dolphin chatter on the title screen. This pretty much showcases the Master System's ability to handle decent voice quality, rarely heard in games for this system. Right off the bat, you are thrown into a decision, left or right. Swimming left will take you to the password screen, which you will be using as the game is long and there is no other form of save feature. The right passage will take you to Ecco's home. The game's story-line is what grips players, it's nice and diverse and again is rarely seen in Master system games (another notable game that has this is Ninja Gaiden, but we'll cover that some other time). 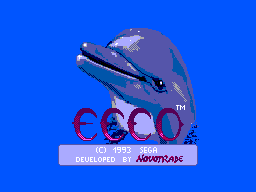 Ecco can sing to other forms of marine life be it another dolphin or an orca for information and clues on how to solve puzzles, a focal mainstay in the entire franchise, you will become familiar with information glyphs and key glyphs as you play. I will say now, that the Master System version features some new levels not seen in the Mega Drive version, thus adding to the exclusivity of this game. Health is gained from charging into fish and both health and air bars have to be closely monitored, as they are constantly being pushed to their limit. This is a hard game, makes me want to strangle the entirety of Novotrade with my wireless mouse while shouting obscurities at the team manager. Really nice actually, the animations are nice and smooth, staying faithful to the Mega Drive version. Obviously taking the limitations of the system into the consideration, I'd say my only gripe is the lack of background in the ocean, but that is a tiny gripe. The background level above the ocean though is astonishing, and the detail of the level designs. I find something graphically new in this game every time I play it, be it either a tiny clam shell attached to a rock face or just another coral, to any fan of the game it always draws you back, even if it's just to look for more graphical goodness. Not so good on this department, baring in mind the level of work that's already gone into the game, sound and music isn't one of them. Ecco's sonar still remains faithful to the Mega Drive port (it sounds the same basically). The music is very choppy and bitty, and there is this god-annoying part at the beginning when your pod is taken from you, it plays this horrific medley that seems to go on for hours, then it just stops all of a sudden. Still to this day, I hate that bit. Still, the sound tends to fade away once you get into the game, so again, small gripe. For the system, very good. Ecco still maintains his high speed and the controls are highly responsive. Ecco has the ability to change from one direction to another at high speed without stopping, and to see this level of responsiveness from a Master system game is simply mind blowing. Controls themselves are easy to wrap your head around, repeatedly tapping Button 2 will speed our dolphin friend up, while holding the button will make his swim at a steady pace, button 1 is Ecco's infamous sonar, while holding the button in will make Ecco perform his Ecco-location, which brings up a map of Ecco's Field of vision. A simultaneous press of both these buttons will make Ecco perform his equally infamous dash attack, useful for killing everything. My opinion is biased, as this is my favourite game of all time (personally, the Mega CD version is my all time favourite). In the past I would have not come back to this, but since becoming a collect and becoming more the wiser, I find myself loving this game more and more. It's once of those games that makes the System shine, and I really do think that the developers of old should have taken a leaf out of this game. Since I found this cartridge, I have been playing it every day, constantly testing my patience, and my limits, and it feels good. Brilliant story-line, astonishing level of detail, fast responsiveness, challenging difficulty and a more than exceptional replay value. Indefinably on of the best games on the system, if not thee best (sorry Sonic, biased opinion, can't be helped). I promise you, your Master System will be gloating once you insert the game cartridge, that is, if you haven't yanked the cart out and smash up your system with it, as I said before, the game is monumentally hard, to the point of being institutionalized. If you beat this, then make a cuppa and rest up, because you earned it my friend. Highly recommend this one, whether you're new to the franchise or not. Nothing will challenge you like this masterpiece. Now excuse me, I have to jump up into the sky and listen to that awful jingle (again).